I really struggled with writing this post. I mean REALLY struggled with it. This is a post about one of the most difficult trials of my life and it still affects me deeply, in some way it probably always will. I hope that by writing this though that you too can see that reconnecting with others is possible. 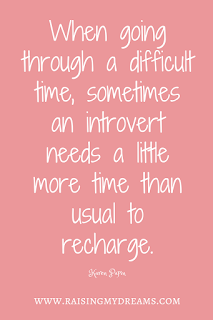 If you aren't an introvert but you love someone who is, I hope that through reading this you come to understand that trials and stressful situations cause introverts to need even more time by themselves to recharge in order to handle the situation they're facing. 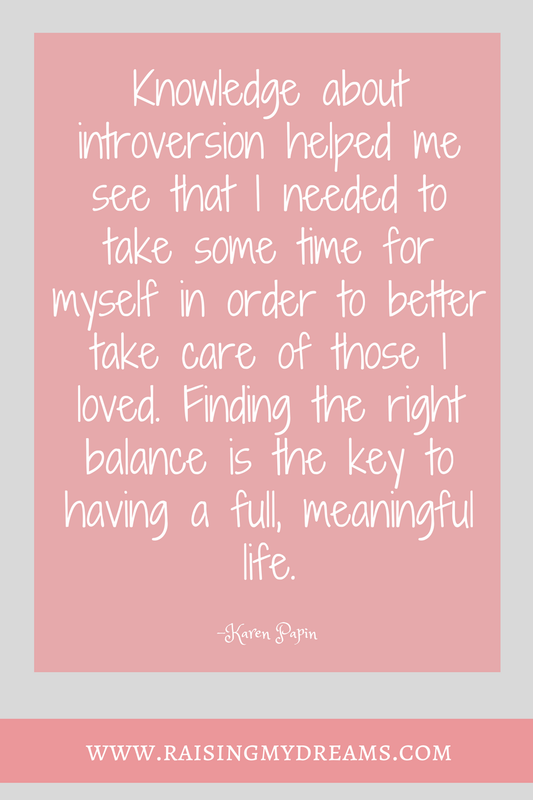 Connecting as a highly sensitive introvert who is also shy is difficult enough for me, but after going through a difficult trial and depression, it was even harder for me to connect. I am still working on reconnecting and reaching out. Sharing this is part of the process. Ever since I was a little girl I wanted to be a mom. I remember how much I enjoyed being a “mom” to my dolls and stuffed animals. I made sure I tucked each one in comfortably at night. As I grew older, I knew it would be some time before I would become a mom and I also knew that the Lord might have other plans for me. So, I put that desire aside. After earning my bachelor’s degree in psychology, I married a wonderful man. Together we planned to have a child. Yet, it didn’t happen right away. After a couple of years we began to worry and started to look into infertility treatments. We were so thrilled. We quickly let our parents know. We planned it out, coming up with a cute way to let each of our parents know. We went to our first ultrasound appointment both anxious and excited. Seeing the little heart beating on the ultrasound was so unreal to me. It was beautiful. I fell in love with that little baby inside of me. I was getting close to the end of the first trimester when the bleeding began, just a little bit, but enough to scare me. I went in for an ultrasound. We expressed our concern, but the nurse was not concerned. It was not uncommon for spotting to occur in the first trimester. We started the ultrasound. There was no heart beating. The nurse went to get the OBGYN, but I knew, I would not be able to hold my baby. The doctor came in and my husband held me as it was confirmed that we had lost the baby. A chromosomal abnormality we were told. I had no control over it. Nothing that I could do to keep it from happening again. One thing that I learned from this experience is that I really don’t like statistics. Apparently, it’s fairly common for someone to get pregnant again within a year after a miscarriage. But, it didn’t happen for me. I wasn’t even sure if I could get pregnant again. It seemed that it was just some fluke that I got pregnant in the first place. Each month would bring a new heartbreak, every month reminded me of the child that I had lost. Every month. I closed myself off. I went into my introvert shell. I went through the motions with my closest friends and family. But, I didn’t reach out. I didn’t seek connection either. Only my husband really knew what I was really going through. He was my constant support, though it tore him apart to see what this trial did to me, all the while dealing with his own pain from it. We turned toward each other and supported each other. Looking back, I am so thankful that this trial strengthened our relationship rather than destroyed it. As time passed, we became unsure what to do. We tried some infertility treatments, but they did not work. I hated the uncertainty of knowing whether or not anything would work. We more seriously started to consider adoption. When we came to a decision to adopt we called up an adoption agency and were told that they were no longer servicing our area. That derailed us a bit. We decided to wait a little longer. Then I received some amazing and almost unbelievable news. I was pregnant. Neither my husband nor I could really believe it. We talked with the OBGYN that we were seeing for infertility and told her of our anxiety around the pregnancy. We were worried that we would lose this child as well. She understood. We had ultrasounds more often than usual to make sure that things were progressing normally and once we were in a safer point in the pregnancy, I started to see my usual OBGYN. We took our time letting others know this time, having learned from our previous experience. But, when we found out that we were having a girl, we finally let everyone know the amazing news. I was beyond joyful with each step in the pregnancy. But, I was also really anxious, neurotic even. If there was even a chance that something wasn’t good for the baby, I stayed away from it. Even though the miscarriage that I had had wasn’t caused by anything I did, I sure wasn’t going to do anything that might cause a miscarriage. When I felt the fluttering that comes with the first few kicks, my joy was great. Yet, even then I still worried, constantly looking for movement. For me, pregnancy was long because of the fear that I felt that I would lose my little girl. After a long, 32 hour labor, Lil Bug was born. I could not help the tears that came to my eyes as I finally held her in my arms. I’ll never forget that night in the hospital as I held her in my arms and told her about all the people who love her. You would think that now that I had a child of my own, that my dream had been realized that I would start to reach out again. That I wouldn’t keep going through the motions. 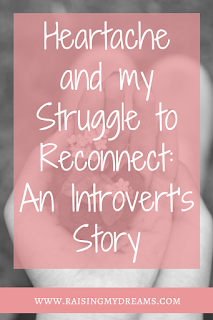 But, even though my dream had come true I still didn’t come out of my introvert shell to connect with others. I still kept my friends at a distance and I still did not make a huge effort to make new friends. I feel that there are two main reasons for why I didn’t try to reach out. The first reason being that I still felt deeply the pain from the miscarriage and heartache we went through with infertility. Here’s the thing about many highly sensitive introverts. We feel emotions on a really deep level. It is easy for us to feel what others are feeling too. Because of this it was hard for me to be around others. To feel their emotions, whether positive or negative. I was too emotionally stimulated with my own emotions to be around others. 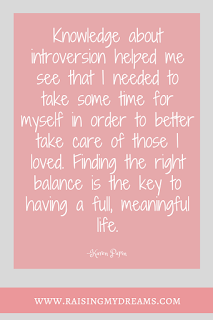 The other aspect of what has been keeping me back is the aspect of introversion. 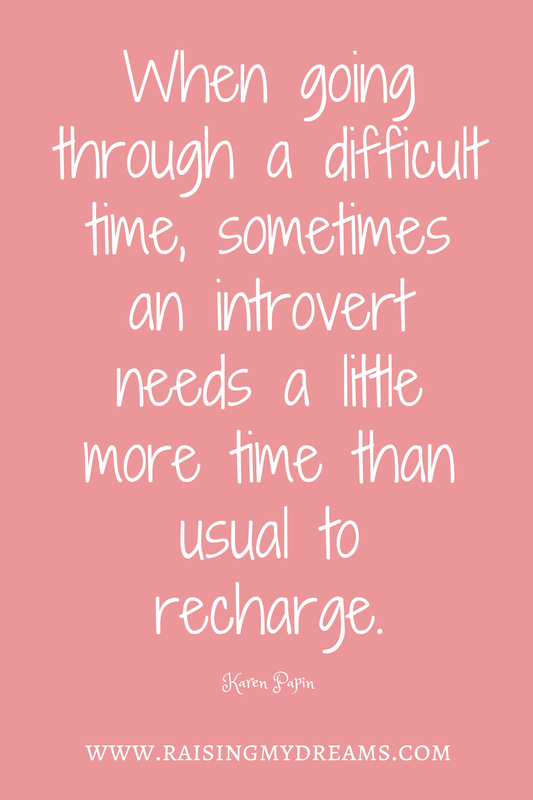 As a new mom, my introvert battery was constantly drained. I was constantly putting my little baby first before myself. This combined with lack of sleep left me not having enough energy to reach out and connect with anyone. It got better after my Lil Bug started sleeping through the night. Things became more routine and I was able to have more moments to recharge. Yet, by the end of the day, I just did not have the extra energy to reach out and connect with anyone outside of my little family. For the time being though, I was okay with that. It was difficult at times as I was often on the edge of burn out (sometimes passed that) but I still enjoyed being a mother and a wife more than anything. I loved my family and they still mean so much to me. They are my greatest joy. The pain in the past made having my daughter that much sweeter and I still relish in the joy of having her every single day. I still feel pain when I think of the baby I lost. Yet, I feel that it is harder for me to take my daughters for granted because of the loss that I did have. I say daughters, plural, because we have since had another precious little girl. My husband and I were blessed to not have to wait as long for another child. She is our Lil Sunshine, so full of life and joy. But, with Lil Sunshine I struggled with depression when she was a newborn. My battery had run dry. I was breaking down because I was giving my all to those I loved most. And though I cherished my Lil Sunshine, I struggled. The things that kept me going during this time was support from family and my faith in God. My love for my family also kept me going because I knew that they needed me and so I kept going, but I broke down a lot. Interestingly enough, this was also where I started to turn around. I realized that I needed to make a change. My husband and I came up with a plan for me to have some time to myself each morning. He watched the girls before he left for work and I would go on a walk/run. It was so freeing. It wasn’t much time but it was just the right amount of time to get charged for the day. By having just this little amount of time each day, I was then able to think of ways I can recharge throughout the day and still have rich, meaningful moments with my two little girls. And I found myself enjoying the beauty of simple things again (like the rain). As I went on my walks, I started listening to Gretchen Rubin’s podcast, “Happier with Gretchen Rubin.” I enjoyed her book, The Happiness Project and so I was excited to find out she had a podcast. I began applying tips from the podcast, working on improving myself. As I worked on improving myself, I began to desire to reach out more to others. I let that desire work within me. It was still some time before I reached the point that I could connect with new people or reconnect with others, but if you let the desire work in you it will eventually lead to action. I began to focus more on my older daughter and how she was a bit different from some of the others kids around her age. I learned more about her high sensitivities and introvert tendencies. As I did so, I learned more about myself. That knowledge, combined with the desire to reach out and connect with others, has led me to this blog. I want to share what I have learned and what I am continuing to learn as I raise these darling girls to be well adjusted adults who understand that the traits within them are strengths, who understand that they can be themselves, love who they are, and thrive. Thanks Stefan! I really appreciate your comment as it reminds me of why I wanted to start this blog in the first place. I am currently in a growing stage and I am struggling to find time to write and edit on a regular basis, but I do plan on posting soon.